There are times when it is necessary to know the round-trip time (RTT) of one or more IP addresses. 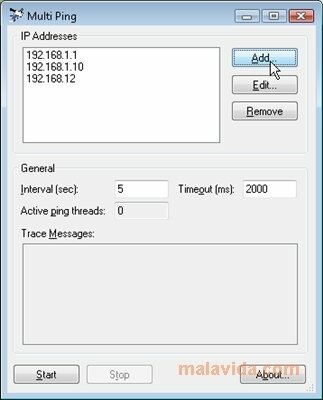 If what you need to know is the round-trip time of one or maybe two addresses, you can always use the Ping command, nevertheless, if we need to know this information about multiple IP addresses at the same time, it is a lot more practical to use a tool like Multi Ping. With Multi Ping, a small utility that doesn't require installation, we'll be able to know the round-trip time of as many IP addresses as we want in the quickest and most simple. All we will have to do is input the IP addresses that we want to find out the information about, and configure the two adjustable settings (Interval and Timeout) before clicking on 'Start'. In a few seconds we will have the Ping information of all the different IP addresses that we had selected. 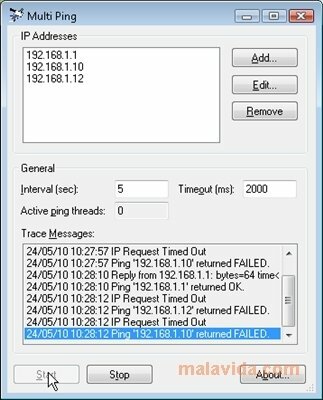 So, if you need to find out the round-trip time of various IP addresses, or if you want to find out if one or more servers have fallen, and you don't want to waste time with the Ping command, download Multi Ping.